” We welcome the COAG Health Council’s commitment to the RHD Roadmap today. The RHD Roadmap was developed by the National Aboriginal Community Controlled Health Organisation (NACCHO) on behalf of END RHD. The fact Aboriginal and Torres Strait Islander people are still three times more likely to experience blindness than non-Indigenous Australians illustrates the need for action. The Federal, state and territory Health Ministers met in Adelaide last Friday at the COAG Health Council to discuss a range of national health issues. The meeting was chaired by the Hon Roger Cook MLA, Western Australian Minister for Health and Mental Health. At the August 2018 Indigenous Roundtable Health Ministers agreed to develop a National Aboriginal and Torres Strait Health and Medical Workforce Plan that provides a career path, national scope of practice and attracts more Indigenous people into health professions. Ministers discussed the approach to develop the Plan noting that the Commonwealth will provide resources to lead its drafting, in full consultation with states and territories and other key stakeholders. Ministers noted that in the course of developing the Plan, there may be value in engaging with other relevant COAG councils with workforce and skills responsibilities to realise meaningful, sustainable outcomes. A draft Plan will be submitted to the next CHC Indigenous Roundtable in July 2019. At the July 2018 COAG Health Council meeting, Health Ministers discussed the potentially preventable burden of disease in Aboriginal and Torres Strait Islander communities caused by a number of health conditions. They discussed work to date to address these health conditions and opportunities to build on these efforts within the context of the Implementation Plan for the National Aboriginal and Torres Strait Islander Health Plan 2013–2023. Today Health Ministers discussed four roadmaps to be a framework to deliver collaborative policies and programs to address this key health challenge. Ministers committed to working jointly to ending rheumatic heart disease and avoidable blindness and deafness. Ministers referred the roadmaps to the Australian Health Ministers’ Advisory Council for review and reporting back in November 2019. Aboriginal and Torres Strait Islander people experience a disproportionate burden of renal disease. Research shows non-Indigenous patients are nearly four times more likely to receive kidney transplants, and Indigenous people are nine times as likely to rely on dialysis. Ministers noted the Renal Health Roadmap, developed by the Commonwealth in conjunction with key stakeholders, as a framework to deliver collaborative policies and programs. The rate of vision impairment and blindness in Aboriginal and Torres Strait Islander people is three times higher than non-Indigenous Australians. The leading causes of vision loss and blindness in Indigenous adults are uncorrected refractive error, cataract and diabetic retinopathy. Ministers noted the Eye Health Roadmap as a framework to deliver collaborative policies and programs. Vision 2020 Australia welcomes the leadership shown by the Minister for Indigenous Health Ken Wyatt AM, along with his state and territory counterparts, in discussing Aboriginal and Torres Strait Islander eye health and vision at today’s COAG Health Council Meeting. Too many Aboriginal and Torres Strait Islander people still experience avoidable vision loss and blindness, and those who have lost vision often find it difficult to access the support and services they need. Our members are working hard to improve eye care for Aboriginal and Torres Strait Islander people, and the plan discussed today is a product of their extensive input and expertise. We encourage all governments, all sides of politics, and the many others involved in this area to work closely with Aboriginal and Torres Strait Islander communities and their organisations to achieve and sustain real improvements in eye health and vision for Aboriginal and Torres Strait Islander people across our nation. One in 10 Aboriginal and Torres Strait Islander adults has Diabetic Retinopathy, which can lead to irreversible vision loss. Rheumatic heart disease is a disease of disadvantage that affects primarily Aboriginal and Torres Strait Islander communities. It is caused by an episode or recurrent episodes of acute rheumatic fever where the heart valves remain stretched or scarred, interrupting normal bloodflow. The Roadmap has used the best available evidence to identify priority actions for the next 10 years. We welcome the COAG Health Council’s commitment to the RHD Roadmap today. 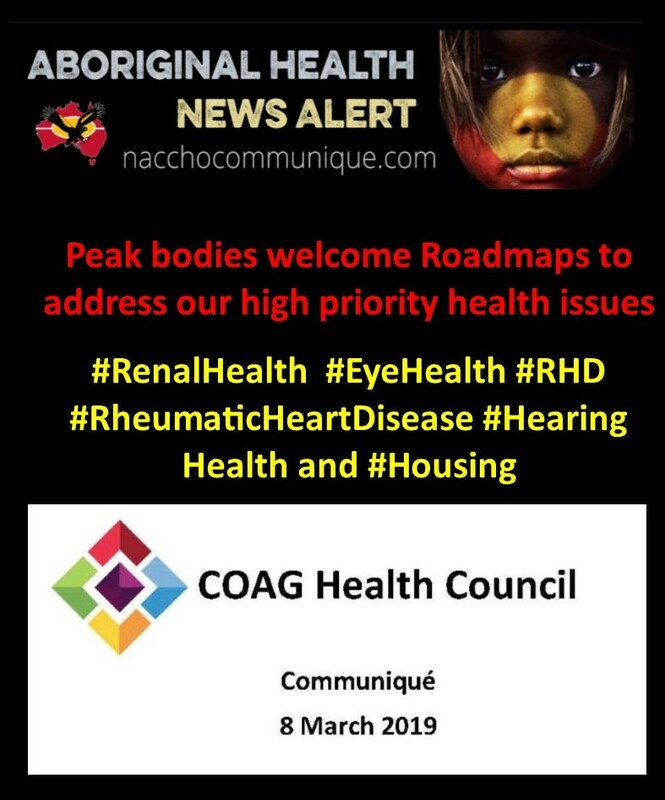 The RHD Roadmap was developed by the National Aboriginal Community Controlled Health Organisation (NACCHO) on behalf of END RHD. We look forward to supporting the AHMAC review of the RHD Roadmap, and ask that the National RHD Steering Committee – which underpins governance of the RHD Roadmap – be convened as a matter of priority to oversee development of the implementation plan. We look forward to working with the Commonwealth and jurisdictional governments, implementing organisations, and communities, to ensure the RHD Roadmap is implemented in a timely, consultative manner, in line with the COAG Implementation Principles as informed by Aboriginal and Torres Strait Islander Communities. We thank Ministers Wyatt and Hunt for commissioning and championing the RHD Roadmap. We thank all our partners who contributed their experience, wisdom, and energies in preliminary consultation. Our goal is to end rheumatic heart disease in Australia. This RHD Roadmap provides a critical opportunity for Aboriginal and Torres Strait Islander people to lead the way to achieve that shared vision. Hearing loss is a complex issue that affects millions of Australians. It is often considered a hidden or invisible issue as, despite the high prevalence of hearing loss, there is limited awareness in the broader community. There is a disproportionate impact on Aboriginal and Torres Strait Islander people due to ear disease that profoundly affects their life experiences through childhood and into adulthood. This has a significant impact on community engagement, education, employment and engagement with the criminal justice system. The Roadmap sets out the short, medium and long-term actions to address the key hearing health issues that have been identified. Health Ministers discussed the conditions that make up the health gap for Aboriginal and Torres Strait Islander people and are associated with a range of social and environmental determinants. Communicable diseases in particular share the same environmental risk factors of poor cleanliness and hygiene, the impacts of which are exacerbated by overcrowded living conditions. Acute rheumatic fever (ARF) and rheumatic heart disease (RHD) are two examples of diseases resulting from overcrowding and poverty in remote Aboriginal and Torres Strait Islander communities. Health Ministers discussed differing approaches to the application of back casting in the Activity Based Funding model for Commonwealth funding to states and territories under the National Health Reform Agreement. State and Territory Ministers will develop a joint set of policy principles and directions on a clear methodology for the calculation of hospital funding for use by the national funding bodies, which will be presented to COAG by June 2019. The World Health Organization’s (WHO) global nutrition target is to increase the rate of exclusive breastfeeding in the first six months up to at least 50 percent by 2025. Low breastfeeding rates and the use of infant formula within the first year of life are linked to obesity and other chronic diseases in later life. In 2016, Health Ministers agreed to develop an enduring breastfeeding strategy following the conclusion of the Australian National Breastfeeding Strategy 2010-2015. The latest National Health Survey data shows that only around 25% of babies are exclusively breastfed to around six months. The Australian National Breastfeeding Strategy: 2019 and Beyond seeks to achieve the World Health Organization target of 50% of babies exclusively breastfed to around six months by 2025, including a particular focus on those from priority populations and vulnerable groups. To achieve this objective, actions are proposed across three priority areas: structural enablers; settings that enable breastfeeding; and individual enablers. Ministers discussed the Australian National Breastfeeding Strategy: 2019 and Beyond and committed to provide a supportive and enabling environment for breastfeeding mothers, infants and families. Ministers were of the view that investing in breastfeeding is an investment in chronic disease prevention and better health. The Commonwealth Department of Health will lead national policy coordination, monitoring and evaluation and report annually on implementation progress to the Australian Health Ministers’ Advisory Council. In 2010, the introduction of the Health Practitioner Regulation National Law Act 2009 saw the requirement for registered health practitioners to have appropriate professional indemnity insurance in place. Despite exhaustive national and international investigations, no available or affordable commercial product in Australia covers Privately Practicing Midwives for homebirth. Health Ministers considered the issue of professional indemnity insurance for privately practicing midwives. Health Ministers emphasised that the safety of mothers and their babies is paramount. Health Ministers recognised that the availability of a suitable professional indemnity insurance product covering private home births would be preferable, as it would allow privately practicing midwives to remain registered under the National Law without the need for an exemption, continue to provide choice to women and take into account the rights of women and children. In the absence of a suitable professional indemnity insurance product for privately practicing midwives, Health Ministers requested that AHMAC would complete additional work to inform the decision of Ministers in relation to the way forward by June 2020. Health Ministers agreed for the current exemption under the National Law to be extended until December 2021 to allow time for options to be explored further. All Australian Health Ministers are committed to the highest quality care for older Australians. The Minister for Indigenous Health and Minister for Senior Australians and Aged Care, the Hon Ken Wyatt MP, provided an update on recent ageing and aged care initiatives, announcements and the Royal Commission into Aged Care Quality and Safety. The Royal Commission has a broad scope to inquire into all forms of Commonwealth-funded aged care services, regardless of the setting in which those services are delivered. It will look at the aged care sector as a whole, including younger people with disabilities living in residential age care. Ministers also discussed a range of issues relating to safe and quality care for older Australians, for example, the provision of primary and community care services to aged care consumers, access to acute care and rehabilitation services, timely movement of consumers from hospital to aged care services and engagement on the implementation of effective mechanisms to regulate restraint in aged care. National Medical Research Future Fund Missions are large programs of work with ambitious objectives to address complex and sizeable health issues that are only possible through significant investment, leadership and collaboration. They bring together key researchers, health professionals, stakeholders, industry partners, patients and governments to tackle significant health challenges, for example brain cancer and dementia. Today Health Ministers received an update from the Commonwealth Minister for Health on the five national Missions and the Indigenous Health Futures announced to date and increased opportunities for contestable grant rounds to support health and medical research. The research work also includes the Indigenous Health Futures for which $160 million from the MRFF has been committed over ten years for a national research initiative to improve the health of Aboriginal and Torres Strait Islander people. Health Ministers supported the work of the research Missions and the Indigenous Health Futures, agreeing to work together towards achieving their aims. Health Ministers acknowledged the significant efforts being made by all jurisdictions to resolve issues that arise from the interface between the NDIS and health systems. States and territories expressed concerns about access to necessary primary care mental health services. States, territories and the Commonwealth will work constructively so that access to primary mental health services is improved particularly for consumers outside the NDIS. The Queensland Health Minister provided an update on regulation of misleading public health information in relation to misleading or inaccurate information regarding vaccines or vaccination programs. Australia has been a world leader in legislation restricting the promotion and advertising of tobacco-related products through sport, and in taking a precautionary approach to the control of smoke-free products such as e-cigarettes. The tobacco industry is investing heavily in smoke-free products and has established associated sports sponsorships launched at the start of the 2019 F1 and MotoGP championship seasons, presenting a challenge to tobacco control legislation. Victoria raised the issue that e-liquids for use in e-cigarettes are not in child safe packaging, do not contain sufficient warnings and may be dangerous or fatal for young children. Health Ministers today discussed a national approach to the prohibition of smoke-free, e-cigarette and related sponsorship and advertising in sport, based on existing tobacco control principles and legislation. This approach will have the capacity to respond to emerging products and forms of marketing. Health Ministers also noted that the Clinical Principal Committee will develop options to better regulate e-cigarettes and related products including consideration of the need to introduce child proof lids and plain packaging, with options to be provided to the COAG Health Council for consideration. A National Medical Workforce Strategy is necessary to guide long-term, collaborative medical workforce planning across Australia. The Strategy will match the supply of general practitioners, medical specialists and consultant physicians to predicted medical service needs and will involve consultation with a range of stakeholders. Health Ministers will fund the development of a National Medical Workforce Strategy. This will include sharing of data across Commonwealth and other jurisdictions to support the strategy. the under-representation of Aboriginal and Torres Strait Islander doctors in the medical workforce. A Steering Committee has been established under the National Medical Training Advisory Network to guide this work. Health Ministers noted community concerns about the unsafe spinal manipulation on children performed by chiropractors and agreed that public protection was paramount in resolving this issue. Ministers welcomed the advice that Victoria will commission an independent review of the practice of spinal manipulation on children under 12 years, and the findings will be reported to the COAG Health Council, including the need for changes to the National Law. Ministers supported the examination of an increase in penalties for advertising offences, such as false, misleading or deceptive advertising, under the Health Practitioner Regulation National Law, to bring these into line with community expectations and penalties for other offences under the National Law. This decision was informed by recent consultation about potential reforms to the National Law in 2018. Ministers will consider the outcomes of the independent review and determine any further changes needed to protect the public.